The Lexus GX invoice price and the true dealer cost are not the same. Note: The Lexus GX 460 pricing report below does not include rebates or incentives. View Lexus Rebates and Incentives. There are two paths of purpose for the 2019 Lexus GX. The first is as simple as getting you to your destination in and around the city. The other purpose proves itself with the GX's off-road performance, sporting a body-on-frame chassis and more than enough protection hardware. The cabin trim and exterior badges point to a vehicle that should be a three-row family hauler, but sacrifices were made along the way to make the GX. Because it's not a traditional unibody construction, the GX body results in a ride more like a truck than an SUV crossover. It results in a rough ride over pavement, and the firm, flat seats don't do anything to counteract that. The GX also uses an out-of-date powertrain. You can tow up to 6,500 pounds with the 4.6L V8 engine just fine, but the fuel economy is pretty disappointing across the board: only 16 miles per gallon combined. There is good news, though. For instance, the 2019 Lexus GX is fully-independent off-road, especially if you add the adaptive suspension option. And although the inside is somewhat dull and dated, it's intuitive and easy to learn thanks to a simple layout. Because there are so many well-rounded competitors, it's hard to make a solid recommendation for the GX. Brand loyalty will be the biggest appeal, all things considered. It's been nine years since Lexus introduced the second generation of GX, and the 2019 Lexus GX is showing its age. This year, the only change is blind-spot monitoring availability. Capable of seating seven, the 2019 Lexus GX is a three-row SUV. The Luxury costs the most out of the trim ladder, but it has the most modern features available. It comes with access to many features not available on the base trim, and the adaptive air suspension improves off-roading. If you're committed to getting a GX, then the Luxury is the way to go. Besides the base trim, there is only one trim to get: Luxury. If you get the second-row captain's chairs, you will just be able to transport six passengers instead. Powering the 2019 Lexus GX is a 4.6L V8 engine capable of generating 301 horses and 329 pound-feet of torque. This comes coupled with four-wheel drive and a six-speed automatic. Sitting on 18-inch wheels, the base trim comes with a flip-up rear window, roof rails, keyless ignition, keyless entry, running boards, and access to the Kinetic Dynamic Suspension System by Lexus. Inside, there's power-adjustable front seats and steering column, foldable second- and third-row seats, simulated leather upholstery, and two-zone auto climate control. You can also enjoy a nine-speaker sound system that comes with HD and satellite radio along with a CD player and two USB ports. Standalone options include a navigation system, LED foglights, a windshield de-icer, and a blind-spot monitoring system that includes rear cross-traffic alert. The Premium package bundles together many of these options and adds tri-zone climate control, leather upholstery, and heated second-row seats. The Luxury has everything listed above along with a rear cargo cover, an auto-leveling and adaptive suspension, headlight washers, automatic dimming mirrors, and even better leather upholstery. This also comes with second-row captain's chairs, so you'll lose a seat for a passenger. Also, this is the only trim where you can upgrade to the 17-speaker sound system by Mark Levinson. For all its drawbacks, the GX does have plenty going for it. That said, the gas pedal calibration and the transmission make it tricky to tame the eager V8 engine. Handling is nimble, but there's absolutely zero feedback from the lifeless steering wheel. Low-slung bodywork reduces the off-roading possibilities, too. The 4.6L V8 engine only makes 301 horses, but it's still eager enough to approach 60 miles per hour in just 7.5 seconds. In typical driving circumstances, the economy gas pedal and the hefty curb weight result in a lazy vehicle. In everyday use, the brakes are reliable and encourage confidence. It takes a little longer to depress the pedal than you might expect, but it's nothing extreme; you'll get used to it. It takes only 124 feet to reach a complete panic stop from 60 miles per hour. In the parking lot, you don't need to turn the wheel very much, and U-turns can be tighter than you'd expect. The GX resists crosswinds, and there's enough power assist, but it's a lifeless steering wheel. There's no responsiveness, and you'll almost feel like your fingertips fell asleep. The suspension cleverly turns around corners and mountain roads with the same articulation as when you're driving off-road. That means you're getting an agile vehicle for its dimensions. There won't be any stomach upset along the way this time. The transmission is smooth, which helps add some refinement to the ride. If only the transmission and throttle pedal were smarter, for lack of a better word. It takes more force than should be necessary to get moving, and even more if you want to downshift. The suspension system automatically produces excellent articulation, and the GX comes with a low-range transfer case. If the ground clearance were higher, then the GX would make a near-perfect choice for off-roading. A lift kit and expedition bumpers can help make it happen, but you shouldn't need third-party equipment to make your investment worth it. 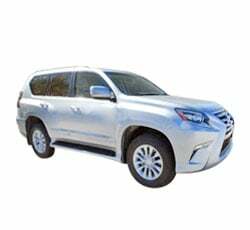 Example: Base Lexus GX 460 invoice price + the dealer Invoice price of options + destination - Holdback = Total Dealer Cost. Note: All Lexus GX 460 MSRP, invoice and dealer cost dollar figures above are approximate amounts. Prices are subject to change without notice.